Google today released an update to its Chrome app for iOS that it first announced last week and released for Android. As promised, Google has added a new synced Autofill feature that allows users to autofill forms in a few taps and also sign into their Google account on Mac or other iOS devices to sync the data. Version 31 of Chrome for iOS also adds a new long press feature for images. When holding an image with a long press, Chrome will now automatically run a search for related images. In addition, Google says the update brings stability and security enhancements. Google’s Chrome Blog has announced that Chrome for iOS will be getting autofill functionality shortly, enabling automated completion of web forms. If you already use Chrome on a desktop machine, the iOS app will sync data between the two. For iPhone and iPad users, Chrome for iOS will soon include Autofill to help you quickly fill out forms on-the-go just as you can on desktop and Android. 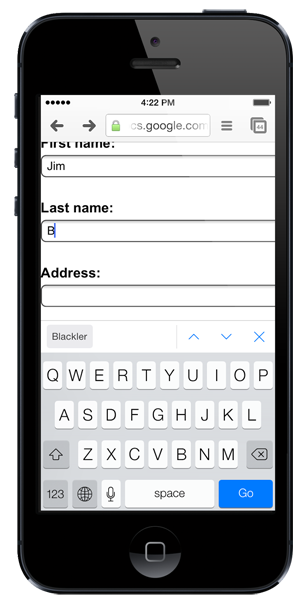 When you sign into Chrome on your iPhone and iPad, you can quickly complete online forms using your synced Autofill info from other devices you’ve signed into. Google says that it is “starting to roll out” the feature from today, but the version of the app on iTunes hasn’t been updated at the time of writing. Safari introduced iCloud Keychain, offering synchronised logins and credit card data, with Mavericks and iOS 7.